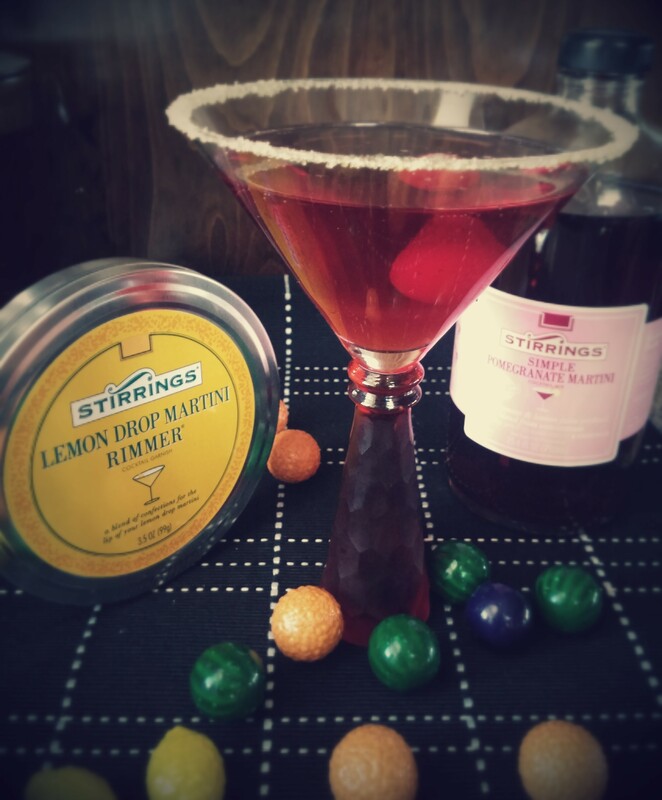 When I was offered the opportunity to participate in the Stirrings Blogger Recipe Challenge using their all-natural cocktail mixers, I knew right away my inspiration would be bubble gum. Why bubble gum? Well, the description of the cocktail mixer I chose, Simple Pomegranate Martini , was a “Sweet-tart blend of pomegranate, lemon juice, and cane sugar.” I guess it was the “sweet-tart” part that got me thinking gum, because my absolute favorite gum is sweet and tart! Then for my cocktail rimmer garnish, I chose the Lemon Drop Rimmer, because that description was, “Drop glimmer like the sun with a sparkly, pucker-up rim of lemon sugar.” Pucker-up! I love it when a sweet and tart piece of gum makes my mouth pucker! I was excited to embark on my mixology quest using Stirrings mixers. One I liked the fact that they contain real juice, have no preservatives, and use triple filtered water so I knew whatever concoction I made would be off to a tasty start and two, I got to not only play bartender but to be a cocktail taster, too! Spread Stirrings Lemon Drop Rimmer on small plate. Gently moisten rim of a martini glass with water. Invert glass onto plate rotating glass until rim is evenly coated. In a cocktail shaker, add vodka, triple sec, and Stirrings Pomegranate Martini Mixer. Fill with ice. Shake. Strain into glass. 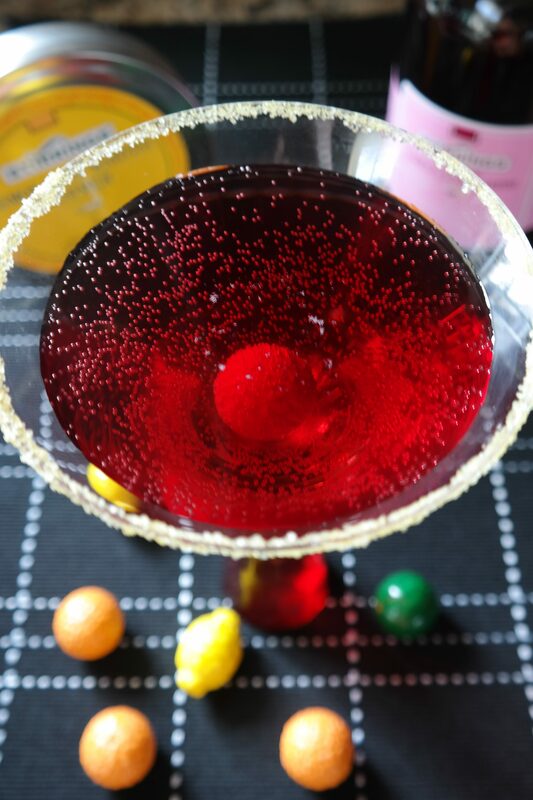 My favorite part of this martini is the candy coated bubble gum. 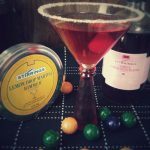 As I sipped and savored the martini, the candy coating added that little touch of sweetness and the best part…when the martini is all gone, there is still something to savor. Ever had a pomegranate vanilla vodka flavored gumball? Head to Stirrings to search by your city for the nearest store (mine is in New Orleans). No store close by? You’re in luck. Order online and have their cocktail mixers, rimmers, and other bar ingredients ranging from simple syrup to Blood Orange Bitters shipped right to your door. 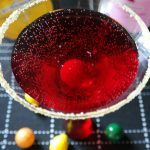 TO COOK IS TO CREATE: Think how much fun this martini tasting would be by trying different flavored gumballs or even different flavored vodkas! FOOD FUN: Did you know the largest bubblegum bubble ever blown according to the Guinness World Record, was 2o inches in diameter?! Betcha that was before a martini!